Real video game professionals know that Tokyo Game Show isn’t just about trying out new games, it’s also about loading up on expensive game-themed merchandise. There’s a startling array of awesome licensed goods here for you to blow your paycheck on; here are the best of this year. 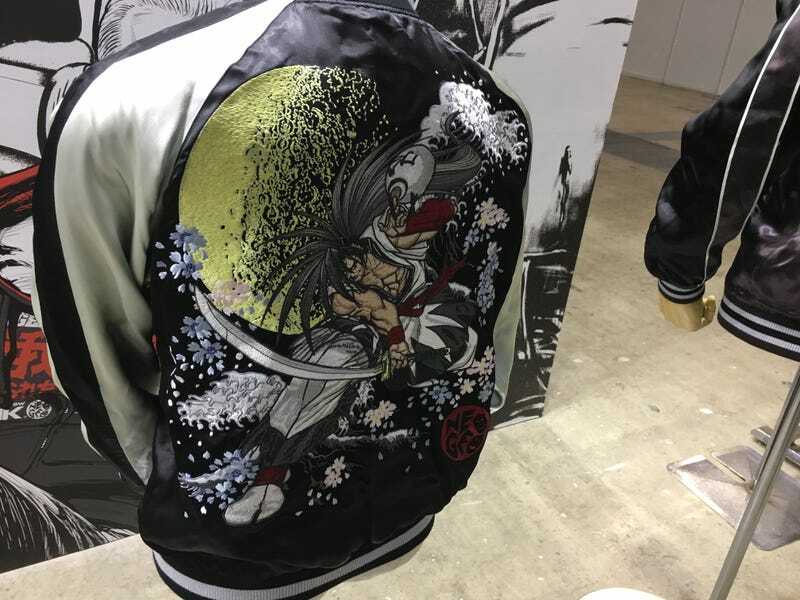 SNK has a pair of beautiful embroidered jackets featuring Samurai Shodown (top) and Metal Slug (above) designs. They’re about $500 and $400, respectively. You have to order them online but there are sizing jackets here on the show floor so you can place your order immediately. There’s a lot of licensed Sega stuff here, and a lot of licensed Saturn goods, but none so odd as this Sega Saturn bathroom scale (about $60). If it tells you you’re failing at your diet, remind it that it failed the console wars. Making its early debut here at Tokyo Game Show is the new Xenogears vinyl soundtrack release, which includes a unique selection of original and arranged tracks from Yasunori Mitsuda’s masterpiece. About $40. What folks are really buying up here at the Square Enix Music booth is this lovely box set containing the two Nier Orchestral Arrangement CDs. At the beginning of each day of the show, the booth has a small allotment of these $80 sets that are signed by both the composer and director Yoko Taro. They disappear within minutes to those determined enough to stampede the show floor as soon as it opens. PUBG has a fairly impressive presence here at the show, and there’s even merch, although this foam frying pan and these keychains are actually American products that you can buy outside the show as well, probably cheaper than the approximately $35 they’re charging. If Japan likes two things, it’s 1) Nier Automata and 2) creepy ball-jointed hyper-detailed dolls, and so it’s no surprise to see the two combined here. These go for about $800 each. This tote bag represents a typical scene in Link to the Past. About $25 and worth every Rupee. Objection! These Ace Attorney plushes are just too cute, Your Honor! At about $20 each, how can you not get the whole set? The apparel and accessories company Anippon, which has a store in Akihabara, consistently turns out incredible design work. Just look at these Fantasy Zone shoes! I’d totally buy some for the $65 they’re charging but my feet have never fit into Japanese shoes of any sort besides, I assume, Japanese clown shoes. I got the lowdown on this $5 Sonic curry. Apparently it’s blue. Like, Sonic blue. The idea is that you would make Sonic’s face with white rice, then pour in the curry to create his hair. Thing is, you know how blue raspberry candy stains your tongue? Same thing here. Lots of phone cases at TGS, but this Okami one is especially elegant. I love this. There’s lots of Mega Man merch at the show, but this is brilliant. It’s a wooden cup for sake (etc. ), and the design is... Wood Man. Every single bit of Pop Team Epic stuff at the show is appropriately unsettling. Check out the dual-sided sleep mask. This PlayStation clay tea cup has a nice heft to it. This is a card case that holds your ID, or train ticket, or RFID card, etc., with the Sonic Mega Drive cartridge label design. About $11. So what if Kojima Productions hasn’t shipped a game yet? They can still open up a merch booth at TGS—and make a killing, from the looks of it. There’s a whole range of high-end Death Stranding stuff, from $100 leather phone cases to fashion accessories like this $300 necklace. Obviously, you can also buy dried squid at Tokyo Game Show—specifically, dried squid endorsed by the host of Game Center CX himself. A bargain at about $10. Again from Anippon, this duo of lovely shirts. I love the Dreamcast treatment here, and I also love the fact that any merch exists at all for Flying Power Disc, aka Windjammers. I admit that I had absolutely no idea what this product was. It was three bags of a powdery substance. I asked the shopkeeper and it turns out it’s bath essence—basically like a bath bomb, but in powdered form, so you can enjoy a Dreamcast (or Saturn or Genesis)-scented bathing experience. $10 for the three-pack. There are many (many, many) enamel pins for sale here, but I just really appreciated the package design for this Morrigan one. Finally, here’s a gold Mega Man. No, not a gold-colored Mega Man figurine, a literal solid gold Mega Man, released for the series’ 30th anniversary. Kind of a ripoff if you ask me; I can’t believe that for $21,000 it’s not even an Amiibo.